Several weeks ago, after a particularly busy day in the salon, Molly and I decided to trade services for some much needed color TLC. You may be wondering why this is such a big deal. We work in a salon and should be able to get our hair done whenever – but it is a complete rarity. Most times we are dashing out the door with color on our heads to rinse out at home or furiously blow drying our own hair in the back room post cut. At first I was confused, until I noticed she was quoting the mirror talker for the new Aveda Cherry Almond Softening shampoo and conditioner. 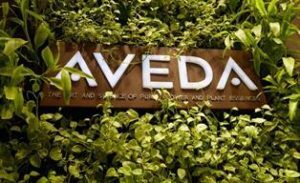 Aveda’s latest campaign: Know What We’re Made Of has been talking about the ingredients in their products and where they came from. It has also been a fun tie in for stylists to talk about their own personalities – and what makes them tick. After five years of working together, Molly definitely has me pegged for my “gentle” spirit and kindness (that would be the sweet part). The wild at heart would come in because a personal mantra of mine is to always “Stay Restless” in life. I always want to keep learning and growing. Fun was then had associating our coworkers with various Aveda products based on their personality traits. We said Emily, our front desk coordinator was like Confixor gel, which is the product we call the Jill of All Trades. If you have gotten to know Emily, she is the QUEEN of multi-tasking. I wrote an entire blog dedicated to her awesome-ness last year (read HERE). I told Molly she was like Phomollient Styling Foam – bubbly personality, builds up her clients’ self-esteem and sweet (as Phomollient contains honey). I’m sure you’ve read this far and are thinking “Steph, that is all fine and dandy. We love that you love your coworkers, however didn’t you mention a NEW product?” Yes kids, yes I did! Cherry Almond softening shampoo and conditioner are a reimagined duo of a vintage Aveda product – the Cherry Almond Bark Deep Penetrating Hair Revitalizer. Similarly as they want to know what their stylists are “made of” Aveda wanted to look back into their history to create something new. The shampoo and conditioner duo promise nourishment, instant detangling, deep conditioning and a restored soft feeling to the hair. There is also the nostalgic cherry almond scent which is created with tonka bean, ylang ylang and orange. Shockingly there is no cherry or almond in the duo as the aromas of each are too faint. The 100% naturally derived aroma you smell is the work of Aveda’s wizard Pure-Fumers who blended 38 different plant and flower essences to create the signature scent. The duo creates a kitten like softness to all hair types while being silicone free. It also makes combing through post pool summertime tangles a breeze. This is thanks to a light whipped blend of shea butter and coconut oil. A beautiful bonus is the duo provides moisture, conditioning and softness without being the slightest bit heavy in the hair – a must for creating WILD volume and WILD texture with a soft, SWEET aroma. 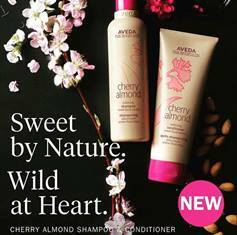 Whether wild, bubbly, sweet or meticulously good at multitasking, Aveda’s New Cherry Almond softening shampoo and conditioner will fit the bill – it may also have you shouting what you are made of!